Trade With The Trend, But Which One? Trading both sides of the chart is one way to super charge your trading. You can effectively increase the number of effective signals you get by simply opening yourself up to trading both bullish and bearish positions. I don’t mean you should be trading both at the same time, at least not on the same asset (unless your trading spreads), I mean you have to be open to taking either a bear or bull signal when one presents itself. This may also sound a bit like I am suggesting trading against the trend but that is not the case either. Think about it like this, every uptrend consists of a primary trend and a secondary trend. The primary trend is the longer term trend, whether it be a bull trend or a bear trend. Every primary trend is dotted with secondary trends, these are the consolidations, pullbacks, bounces and corrections that form as nearer term greed/fear briefly overpowers the longer term driver of the rally. As traders we are taught to follow the trend in order to maximize profits. As binary traders we tend to focus on directional trades. This means, at least for me, I tend to focus on only using trend following signals and trend following trades. If the market was moving up I would trade calls, if down puts. If the signal was strong I would use short expiry, typically one week or shorter, and if the signal was week I would use a longer expiry, usually end of the month or one month. If the signal was not present, unclear or at the potential end of a movement I would also use longer expiry, in order to give the market time to “move on” from whatever it was that was causing the uncertainty. This method works well with binary but upon reflection I realized that I was only trading in line with trend about 66% of the time. What?!? Yes, it’s true. With the right approach you can trade against the trend. The strong signals and even the weak signals were paying off because they followed the primary and secondary trend. It was the uncertain signals and times of indecision that were the ones not profiting and it was because the secondary trend had changed. Take for example the chart below. There is a strong primary trend following signal that I would have a one week expiry on and followed up with additional one week trades. As the market moved up the indicators form divergences that point to a stall in the rally on at least a near to short term basis. At this time I would have switched to monthly expiry in order for the trades to weather the near term fluctuation but if you look here you will see that it didn’t pay off because 30 days after the peak the market was still trending sideways and at a 30 day low. An end of month may have worked depending on where I got in but it would have been dicey. The key here is that the market was still trending sideways 30 days later, this is because there was a change in trend that I was not taking advantage of. The chart above shows only the long term primary trend. When the market reached a point of indecision switching to a longer term expiry makes sense but is not the best choice. 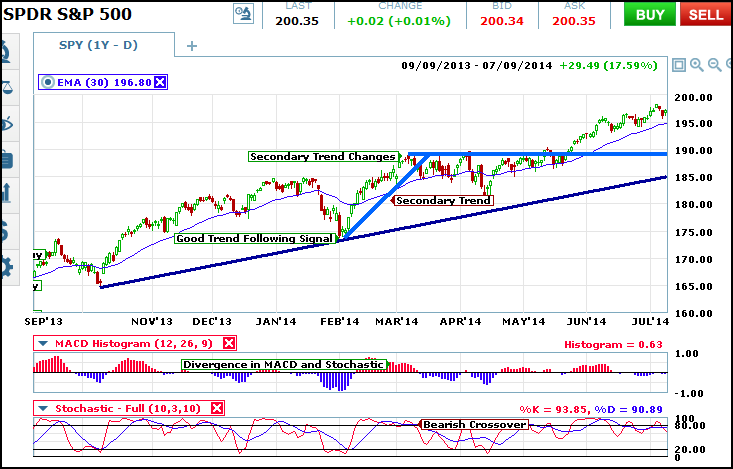 The primary trend is still up but the secondary trend has changed so a change in tactic is also appropriate. The first and safest assumption is that the market has entered a near to short term consolidation range. By this I mean one that may last a few days to a few weeks. Look at the chart below. The secondary trend changes from up to sideways and that changes lasts for about 6 weeks. This means that during that time it will be possible to begin trading from both sides of the chart. When the asset reaches the top or a peak within the sideways trend puts are the right choice. When the asset reaches the bottom of the range or peaks within the sideways trend switching back to calls is the right thing to do. 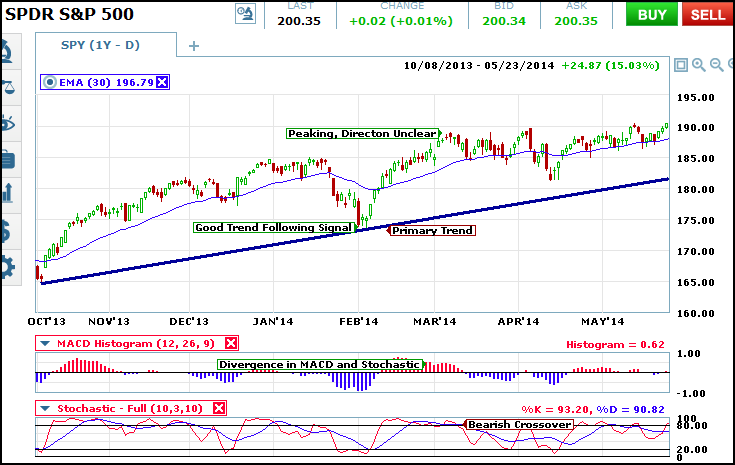 However, with a change in trend and trading tactic should also come a change in expiry. Trades made against the primary trade should be shortened. They just won’t last as long because they are more likely to find support, at least in the near term, and be reversed. This is when I start using end of week, 3 day and end of day expiry. This is also a good idea when trading in line with the primary until the secondary trend moves back in line with it because you just don’t know how long the consolidation is going to last. Of course, as time goes on additional primary trend following signals will develop and at that time the longer term expiry can be employed; one month for the weaker signals and then one week once the signal becomes strong. Since making this revelation I have been able to improve my success rate dramatically. Now, instead of blindly making those longer term trades with the hope the market would move in time I change tactic with the secondary trend and capture more, profitable, trades.